Young dog trainer heading to Crufts! A SPECIAL partnership between Danielle Gregory, aged 10, and her Belgian sheppard, Kite, has won them qualification for Crufts 2019 in the ‘top class obedience’ final. 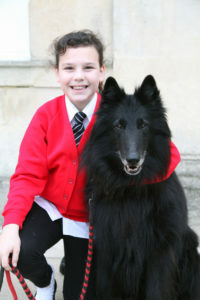 Danielle, a pupil at Aloeric Primary School, will compete as a member of the Young Kennel Club in the final at Crufts in the Birmingham NEC on Friday 7th March. Kite was first taught by Danielle’s great-aunt, Sue Aldridge, before retiring him last year. However, Danielle wanted to carry on Kite’s training, and the pair competed in competitions across the country, to earn their qualification in this year’s Crufts. Kite is also deaf so cannot respond to vocal orders. Danielle has worked extra hard over the last year to learn waves and hand signals to communicate with him. The competition will see Danielle put Kite through his paces to perform obedience tricks such as heel work at three different speeds, slow, normal and fast, a send away and recall, scent work and a retrieval. One Response to Young dog trainer heading to Crufts!